Creating a Calgary custom home can afford you the opportunity to create the kitchen of your dreams. While there are really no limits to the options available, conventional wisdom does categorize kitchen layouts into four standard designs: peninsula kitchens, U-shaped kitchens, L-shaped kitchens and galley kitchens. Each of these four major kitchen types also draws on similar principles when it comes to arranging the room’s major elements. By applying these principles, you can create a customized kitchen that maximizes efficiency, safety and ease of use. The basic layout of a peninsula kitchen creates two parallel work spaces: one along a wall, and a second on the opposite wall or as an island in the middle of the room. A single lane permitting traffic to move through the kitchen separates these parallel spaces. However, foot traffic can cause congestion in peninsula kitchens. They also work best when only one person is doing the cooking, and they tend to be better-suited to smaller spaces. A U-shaped kitchen contains counters, shelving, cooking areas and sinks on three of the room’s four sides, with the final side remaining open to allow access. Many U-shaped kitchens also incorporate an island in the centre, which creates even more usable work and storage space. U-shaped kitchens are ideal if you’re looking to maximize the amount of work space, or if you regularly have multiple people working in the kitchen at the same time. They can also be scaled up and down, and because they don’t allow traffic to move through the room, they are minimally disruptive. However, U-shaped kitchens can be inefficient if they’re too large, particularly if you don’t utilize a centre island. It can also be difficult to access certain cabinets in a U-shaped kitchen, particularly those in the bottom corners of the room. An L-shaped kitchen is like a truncated version of a U-shaped kitchen, with two counter/work areas configured in right angles to one another. L-shaped kitchens are excellent for maximizing corner space, and they can easily be adjusted to accommodate any length. They are also ideal if you want to divide the kitchen into discrete work are add a table and chairs to the vacant corner of the room. However, L-shaped kitchens also have their drawbacks. Like U-shaped kitchens, they tend to be inefficient in larger spaces, especially without an island. They also don’t support multiple cooks very well. Also known as “corridor kitchens,” galley kitchens creates two separate work spaces on opposing walls. The centre of the room is left open. 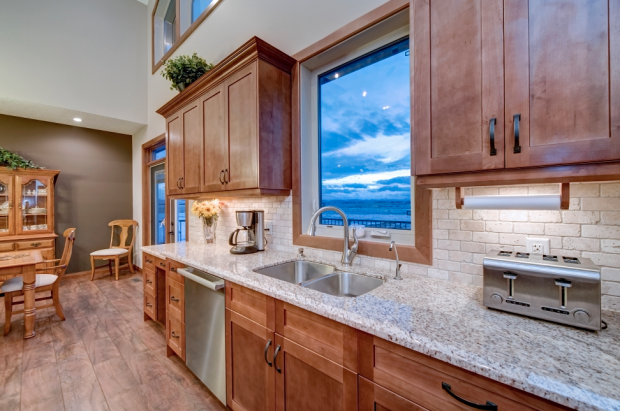 If you have a smaller kitchen, a galley layout is among the most efficient available designs. However, traffic congestion can be a problem if people are passing through the kitchen during food preparation. Galley kitchens also aren’t great for multiple cooks, and they aren’t the best option if your home has an open floor plan. Regardless of which kitchen layout you choose, remember to apply the “triangle principle” when arranging the room’s elements. This principle holds that the kitchen’s three key appliances – the fridge, the stove, nd the sink – should be configured in a triangle. In other words, if you draw straight lines from the sink to the stove, the stove to the fridge, and the fridge to the sink, you should be left with a fairly even-sized triangle. Fine Line Homes is a leading builder of luxurious yet energy-efficient homes erected with sustainable practices. Our philosophy is simple: to create striking yet affordable and ecvo-friendly homes that deliver outstanding value and return on investment. If you’d like to learn more about our proven system for building, or for further information about the custom home design and construction processes, please register to receive our free, no-obligation information package.